Biography & Genealogy: John Dehart Ross, Class of 1859: Born- May 1, 1840. Matriculated from Brandy Station, Va. At VMI 3 years. Lt, Assistant Professor of French and tactics at VMI. 1860-61. Took shipment of powder to Harpers Ferry spring 1861 and helped drill troops there until ordered back to VMI to help train Class of 1864-MS. Appointed Lt, Engineers, Provisional Army of Virginia July 1861. On duty with Brig Gen (later Maj Gen) W.W. Loring. 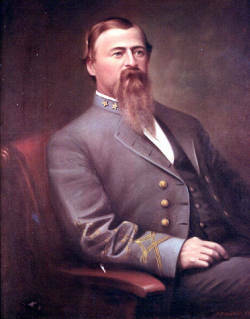 Appointed Maj, 52nd Virginia (date of rank August 1, 1861). Sent back to VMI faculty early 1862. Elected Maj, 52nd Va May 1, 1862. Severely Wounded in Action (Right hand, leg) at Cross Keys. Detailed as Enrolling Officer, 11th Congressional District of Virginia (Lexington, Staunton) 1862-63. To Lt Col, 52nd Virginia October 24, 1863 (date of rank June 6). Brought charge of imcompetence against colonel of regiment. Court found for colonel. That plus his wounds led him to resign December 19, 1863. Taught at VMI 1863-65. Sought staff appointments early 1864. Paroled at Staunton May 23, 1865. Married Agnes J. Reid 1862. Post War Career: Admitted to bar but never practiced. Held several minor officers. Teacher; farmer; public official. Studied law. Died- December 12, 1912. Buried Stonewall Jackson Cemetery, Lexington.